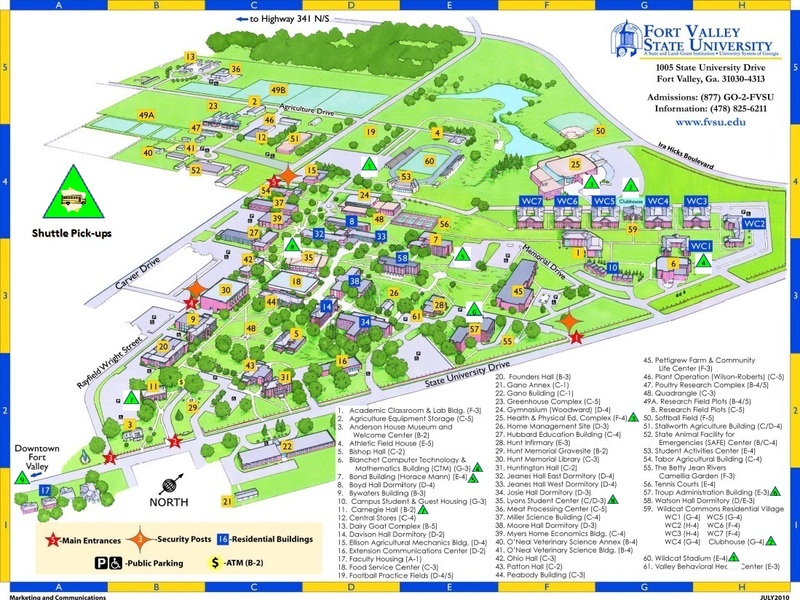 Travel I-75 N and Take exit 136 for US-341/GA-7 toward Perry/Fort Valley keep left at the fork; follow signs for Fort Valley/Fort Valley State University. Turn left onto US-341 N/GA-7 N/Sam Nunn Blvd. Continue to follow US-341 N/GA-7 N until you reach Ira Hicks Blvd. Turn left onto Ira Hicks Blvd and continue until you come up to the entrance gate on the right. This will be the Health and Physical Education Complex entrance. Take the US-80/GA-22 exit toward Phoenix City/Macon continue onto GA 96-E. Turn right to stay on GA 96-E. Travel east on GA 96 until you reach GA-49. Make a slight right onto GA-49 (South Camellia Blvd). Travel south on S Camellia Blvd until you reach Ira Hicks Blvd and when you come to the first stop sign on Ira Hicks Blvd keep straight and enter campus at the first entrance gate. This will be the Health and Physical Education Complex entrance. Take I-16 W toward Macon. Take exit 39 for GA-26 toward Montrose/Cochran. Turn left onto GA-26 W. Make a right onto GA-87 N/US-23 N. Turn left onto GA-96 W. Next, make a left onto GA-49 (South Camellia Blvd). Travel south on S Camellia Blvd until you reach Ira Hicks Blvd and when you come to the first stop sign on Ira Hicks Blvd keep straight and enter campus at the first entrance gate. This will be the Health and Physical Education Complex entrance. Take GA-49 N/Crawford St and continue on GA-49. Turn left onto GA 49 N/GA-90 S continuing on GA-49 N. Turn left on GA-49 N/Camellia Blvd. Turn right on Ira Hicks Blvd and when you come to the first stop sign on Ira Hicks Blvd keep straight and enter campus at the first entrance gate. This will be the Health and Physical Education Complex entrance. Travel I-75 S/I-85 S then make a slight right turn onto I-475 S Bypass to Valdosta then take exit 149. Turn right onto GA-49 S/Peach Pkwy. Travel to Fort Valley on GA-49 Peach Pkwy. Turn left on Ira Hicks Blvd and when you come to the first stop sign on Ira Hicks Blvd keep straight and enter campus at the first entrance gate. This will be the Health and Physical Education Complex entrance.